It’s warm out. And when it’s warm, we tend to switch the type of food and drinks we consume. But have you ever thought that what may be good tasting may not be making your smile happy? There are many common summer treats that, while tasting fantastic, are causing damage to your smile. Everyone at my dental office in Douglasville wants to educate you on what some smart summer snacks are and which ones to avoid. While you’re enjoying the summer sun, make sure that you’re choosing snacks that not only hit the spot, but are healthy for both your body and your smile. At my Douglasville dental office, we encourage you to make healthy decisions about the treats you buy next time you’re at the grocery store. Your teeth, and your dentist, will thank you for it. Serving patients in Douglasville, Lithia Spring and Villa Ricca. Snoring can be annoying, especially if you share a bed or room with a snorer. Your sleep gets interrupted, you become tired of using earplugs, and you may even go sleep in a different room. But snoring can not only put a dent in your relationship, it can also be a sign of something serious. At my dental office in Douglasville, we like to educate our patients on the dangers of snoring. At my Douglasville dental office, we strongly encourage anyone who snores, sleeps with a snorer, or who has signs of sleep apnea to get checked as soon as possible. Some of the other common symptoms associated with sleep apnea include feeling as if you never get enough sleep, waking up choking or gasping for breath, unintentionally falling asleep during the day, and chronic fatigue. Nothing bugs us more than when people make up stories to try and scare others. We’ve all heard of urban legends, and some of us may have even fallen victim to believing them. What concerns all of us at my Douglasville dental office are the legends that cause misconceptions about dentistry and the fact that, if believed, could cause people to avoid dental care. One of the most common dental urban legends out there is one that says root canals are super painful when, in fact, they’re really not a big deal. Those who have had a root canal often say that there was little or no pain involved in the procedure. Where the misconception of pain comes into play is before the procedure even happens. Root canals are needed when there is an infection or deep decay and, as a result, a lot of pain. What your Douglasville dentist wants you to know is that a root canal is a way to relieve the pain, not cause it. Lastly – and this one is really important – is the belief that if gums bleed, it’s not a big deal. At my dental office in Douglasville, we try to educate our patients on the fact that bleeding gums are a sign that something is not right. Healthy gums don’t bleed unless you’re brushing or flossing too roughly. Bleeding gums often mean that you have developed gum disease or even gingivitis. If left untreated, gingivitis could lead to periodontitis and eventually loss of teeth. 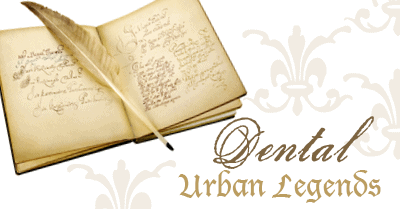 Don’t let common dental urban legends keep you from a strong and healthy smile. If you hear of a dental story that you think may not be true, just call my Douglasville dental office. We’ll be sure to set the story straight, relieve any fear you may have, and get your smile strong and healthy. Serving patients in Douglasville, Lithia Springs and Villa Ricca. You’ve finally made it to your destination. You’re ready to relax, and your vacation has officially started. All of a sudden, it happens. An unexpected dental problem pops up from nowhere and threatens to ruin your hard-earned time off. But don’t worry, tips from my dental office in Douglasville can help get you back to smiling – and back to that hammock. A dental emergency can mean anything from a chipped tooth to a lost filling, a knocked out tooth to a toothache. But just because a problem in your mouth occurs when you’re not at home doesn’t mean that you can’t fully enjoy your vacation. There are several ways you can resolve or ease a variety of dental problems even when you’re away from your Douglasville dentist. 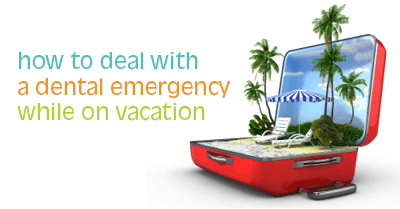 While these tips can help you get back to your vacation, perhaps the best way to avoid a dental problem while out of town is to get a checkup before you leave. At my Douglasville dental office, we will make sure your mouth is in its best shape and that there aren’t any potential dangers just waiting pop up as soon as you lay down your beach towel. You can also help protect your teeth by avoiding dangerous snacks like popcorn, sticky candy, and chewing ice. If you’re planning a vacation, schedule a pre-trip appointment at my dental office in Douglasville.